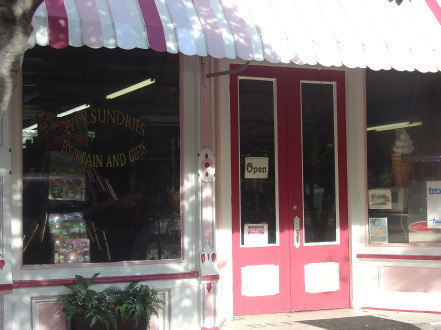 Open Monday-Saturday 10 a.m.-8 p.m. and Sunday noon-8 p.m.
Come and see the original marble soda fountain. It is part of a winning entry for the 8 Wonders of Kansas Customs. Enjoy fountain drinks and ice cream treats, as well as grilled sandwiches, cinnamon rolls and lots more. Children have been coming into the drugstore since the 1920s for ice cream and sodas. Sit at the original marble top tables and chairs. The original spigots are for display only. Called 'the drug store' through the years, the 1888 building still has original pharmacy fixtures and even some original products. Today you'll find a brilliant selection of gifts and cards, wii for the kids, and a signal for your laptop. Try the fresh-squeezed cherry limeade!